Robin Chin, Katie Dahl, Tracey Jaquith, Roger Macdonald, Nancy Watzman, and Dan Schultz are contributing research and engineering for the Trump Archive. Now it’s easier to find fact checks of specific statements by President-elect Donald Trump in our new Trump Archive, an experimental collection of TV news clips featuring Trump–including fact checks of his press conference on January 11, his first since July 2016. We’ve got 500+ fact checks by FactCheck.org, the Pulitzer-prize winning PolitiFact, and The Washington Post‘s Fact Checker embedded within the Trump Archive; these are now viewable on this dedicated page, with the option of downloading a csv containing links to fact checks, links to TV news clips, date of airing, and topics covered. 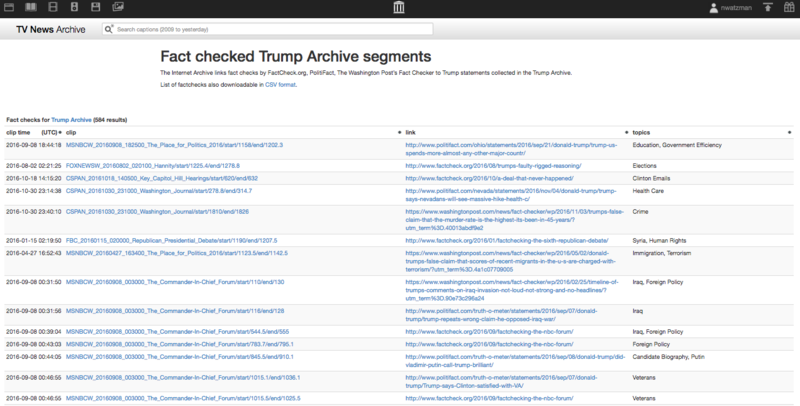 The Internet Archive’s Trump Archive launched on January 5 with 700+ televised speeches, interviews, debates, and other news broadcasts related to President-elect Donald Trump, and it continues to grow. We created the Trump Archive in response to journalists and scholars who had trouble finding clips of Trump speaking through the caption search function in our TV News Archive library. We are hand-curating this collection as an experimental prototype for learning how to engineer solutions so similar archives can be created–whether by the Internet Archive or members of the public–about other elected officials and topics of interest. We are looking for collaborative partners to explore artificial intelligence approaches to creating such collections, with an ease and scale far beyond what can be accomplished now by hand. The list of fact checks in the Trump Archive includes claims made by Trump during his press conference on January 11 covering issues from health care to ISIS to Trump’s connections to Russia. Here’s a sampling. PolitiFact: “It’s true that Trump has yet to build a hotel or tower in Russia, but he has eyed the Moscow skyline for decades. We do know that Trump agreed to host the Miss Universe pageant in Moscow in 2013, a $20 million deal facilitated by a Russian real estate mogul and billionaire Aras Agalarov. (Trump also cameoed in Agalarov’s son’s dance-pop music video). He also made millions selling a 17-bedroom Florida mansion to a Russian billionaire. The Washington Post‘s Fact Checker: “Trump is being misleading when he says he has stayed away from Russia. Trump repeatedly sought deals in Russia. In 1987, he went to Moscow to find a site for luxury hotel; no deal emerged. In 1996, he sought to build a condominium complex in Russia; that also did not succeed. In 2005, Trump signed a one-year deal with a New York development company to explore a Trump Tower in Moscow, but the effort fizzled. This entry was posted in News, Television Archive and tagged Donald Trump, Factcheck.org, Health care, ISIS, Obamacare, PolitiFact, Russia, The Washington Post's Fact Checker, Trump Archive. Bookmark the permalink. Is this what our donations to archive.org go to? The obsession with Trump is getting tiring. Please think of your non-American users and donors, too, or at least archive things about Trump that matter, like memes. Yeah, I agree. I worry that the Trump supporters are being alienated from the Internet Archive and think they deserve an Internet Archive as well. In my opinion there should also be a Hillary archive, just to even things out. Trump may do good things for America. But yeah, it’s important to have a backup of archive.org in different locations of the world. So many videos of Trump disappeared from youtube after he was inaugurated (the same day, at night). That was definitely Trump administration who requested to remove lots of content.. For example, many WWE videos, old RNC videos, The Apprentice videos, etc.. Just mysteriously disappeared and channels who uploaded them were terminated, not all of them, but the results you search for are reduced by 70% in search results now. I for one celebrate this archive. If you can see what a politician says for yourself it makes it easier for the rest of us who maybe don’t read 100% of the news every day to verify what really happened. I’d love to see more of these for all politicians, and I disagree with posters above who feel like this is isolating to Trump supporters. If you like what the guy has to say, why would you care if other folks can look it up later?